Andreas Lubitz, the co-pilot who allegedly deliberately crashed Germanwings flight 4U9525 into the Alps on Tuesday, was described as a "normal" and "very nice" young man by those in his German hometown. "I got to know him...as a very nice, fun and polite young man," Klaus Radke, head of the local flight club in the town of Montabaur in western Germany, told Reuters, also describing Lubitz as "a completely normal guy." Lubitz, 28, was unmarried and had no children. The man – whose likely voluntary actions allegedly led to the Airbus A320 crash, killing all 150 people on board – received his first flying license at the Montabaur club. Later, he returned for a refresher course with Radke, Reuters reported. People in the small town of some 12,000 residents were shocked on Thursday after French Marseille prosecutor Brice Robin announced at a press conference that Lubitz, the co-pilot of flight 4U9525, appeared to have locked himself inside the cockpit and operated the plane's fatal descent into the mountains. "I'm just speechless. I don't have any explanation for this. Knowing Andreas, this is just inconceivable for me," Peter Ruecker, a long-time member of the flight club, told Reuters. "He was a lot of fun, even though he was perhaps sometimes a bit quiet. He was just another boy like so many others here," Ruecker, who knew Lubitz well, added. "Andreas became a member of the association as a teenager, he wanted to realize his dream of flying. He began as a gliding student and made it to become a pilot on an Airbus 320," a statement released by the flying club of which he was a member, said. "He was able to fulfill his dream, the dream he has now so dearly paid for with his life," the club said, adding that its members are in mourning and "will not forget Andreas." In a Facebook picture, the first officer for Lufthansa's budget carrier is seen posing by the Golden Gate Bridge in San Francisco. According to his profile on the social media site, which was taken down on Thursday, he appeared to have led an active lifestyle. He was a running enthusiast and a music fan. "He had a lot of friends, he wasn't a loner," Ruecker told Reuters, adding that the young man "was integrated in the group." According to German Interior Minister Thomas de Maiziere, Lubitz had no known association with terrorist groups, with the official claiming that "we checked everything." Sounds on the recovered voice recorder suggest he was alive and breathing until the moment of impact. Lubitz was trained at the Lufthansa pilot training academy in Bremen. At the time of the fatal flight, he had 630 hours of flying time to his name and had worked for Lufthansa since 2013. Meanwhile, the captain – who was allegedly prevented by Lubitz from entering the cockpit – had over 6,000 hours to his name and had worked for the airline for 10 years. 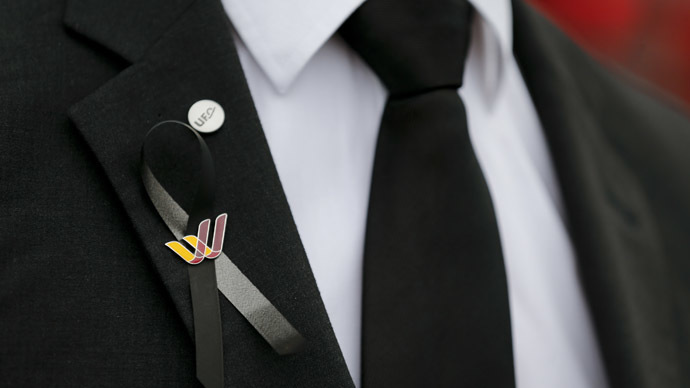 Lubitz had taken a break in his aviation training, Lufthansa CEO Carsten Spohr told a press conference on Thursday. According to Spohr, he started his training in 2008, but then had a break of several months. The company head did not provide any details as to why Lubitz had temporarily terminated his training, but said there was nothing unusual about such intervals. A Spiegel reporter, Matthias Gebauer, tweeted that some friends of Lubitz said he had burnout or depression back in 2009, which resulted in a break from his training. The Airbus A320 crash in the French Alps has been described as "beyond our worst nightmare" by Lufthansa's head. "It leaves us absolutely speechless," Carsten Spohr told reporters in Cologne, also explaining that the investigation has so far shown that the flight's captain tried to punch the emergency number into the cockpit door to enter back from what was presumably a toilet break. However, the co-pilot had blocked access by pressing a button. "You can never exclude such an individual event,” Spohr said, adding that Lubitz had passed all the necessary medical tests and was "100 percent" fit to fly. However, he added that pilots do not undergo regular psychological assessments beyond training. "In a company that prides itself on its safety record, this is a shock. We select cockpit personnel carefully," the Lufthansa CEO said. "He pressed this button [to initiate the descent] for a reason we still don’t know why," Marseille prosecutor Brice Robin said. "He didn’t say a single word after the pilot left the cockpit." "When you commit suicide, you die alone. When you have 150 people on the plane, I wouldn’t call it a suicide. That is why I am not using this word," he added. "Every person is an individual, but if this is the case that the plane was flown into terrain on purpose, then obviously there was a major problem of a psychological nature with the first officer," Marin Medic, an A320 pilot, told RT. He added that a “variety of things" could have caused such an outcome. "Anyone can be depressive, but you would think the colleagues would notice that. Although, truth be told, pilots are coming under more and more pressure as the industry seeks to expand and the work conditions deteriorate," the pilot said. In 2013, Andreas Lubitz was recognized as a certified pilot by the Federal Aviation Administration (FAA), which included him in the prestigious FAA Airmen Certification Database, among other pilots who have met or exceeded the high educational, licensing and medical standards established by the FAA.